Less than 30 miles east of Concord, Gold Hill was once a thriving mining community. Now a quaint country village, it’s a destination for those intrigued by the paranormal. Author and historian Vivian Pennington-Hopkins is vice-president and director of education for Historic Gold Hill and Mines Foundation. 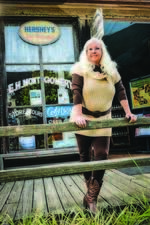 She and her husband also run the E.H. Montgomery General Store, built in 1840. Hopkins is a North Wilkesboro, NC, native whose family moved to Gold Hill when she was a teenager. Hopkins familiarized herself with the rich gold (and copper) mining operations that once saw Gold Hill’s population larger than Charlotte’s. The Barnhardt and Randolph gold mines dominated the 23 mines that brought as many as 5,000 men to work them in the 1840s. The town’s ore operations prospered until men began leaving for the California Gold Rush of 1849 and then the start of the Civil War. By 1861, the mines were almost at a standstill. “It was such a tragic time. Mining was such a difficult job,” Hopkins explains. Indeed. These mines were hundreds of feet deep – Barnhardt at 500 feet and Randolph at 800 feet – dug vertically into the ground with arms of horizontal tunnels extending off the main shaft. It was a cold, damp and dangerous job. Employee housing was dismal, and disease killed many…if the mines didn’t. Hopkins says, referring to the years after mining operations ceased. What had once been a vibrant main street with 29 cabins, 26 saloons, six brothels and a jail was no longer recognizable. What was occurring, however, appeared to be the revisiting of some who had lost their lives in Gold Hill. 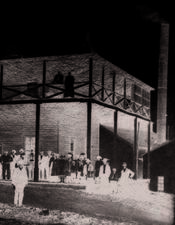 Between her interest in Gold Hill’s history and the apparent interest of others in the paranormal activity taking place there, Hopkins became involved in both digging out and preserving the historical structures of the town as well as with the Carolina Paranormal Society. Some sightings took place during the gold rush, but others are more recent and still happening today. Pennsylvanian Aaron Klein came to Gold Hill in the 1840s to work the mines. The son of a rabbi, he was picked on by the other miners, but also met and fell in love with Elizabeth Moyle, the daughter of a mine manager. Imagine the ratio of men to women during this era, and you’ll realize the jealousy that likely arose when a woman was deemed spoken for. With their wedding planned, Stan Cukla (“Big Stan”) – a fellow miner – let his jealousy and anger be known. One morning, when a group of miners approached the Randolph shaft to start work, they found Klein’s puppy dead. And Klein had simply disappeared, his body never found. Not long after, a mysterious light began showing up near the Randolph shaft, as well as the whining of a puppy. The occurrences shook everyone, including Big Stan, who went into the mine at all hours in an apparent search for something. When miners came to work one morning, they found Big Stan at the bottom of the mine, dead on the skip (hand-drawn elevator), which should have been at the top of the shaft. Was Aaron responsible for the fall? Years later, a fisherman at the back of Gold Hill Pond was soundlessly approached by a young man and his puppy; they would have had to come from the woods. The fisherman spoke to the man but went unanswered. His buddy, fishing a little further down the bank, asked whom he was talking to. The young man and his puppy were nowhere to be seen. Elizabeth grieved the loss of Aaron until her death; she never married. 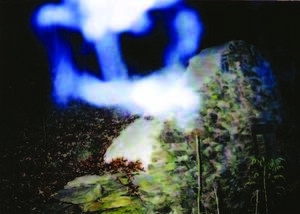 People have since reported seeing her in the Gold Hill Mines and Historic Park or near Gold Hill Pond, which was once used to pump water into the mines. Gary Russell, a Gold Hill native, thinks he may have seen Elizabeth as well. Patrolling the park one Saturday in his pick-up truck, he saw a young woman by the pond. She turned around and approached Russell, and he verbally acknowledged her, but she just walked past his truck window, not saying a word and staring straight ahead. When he looked in his rearview mirror, she was nowhere to be seen. The Powder House is a tunnel-like brick structure built into a hillside. “It contained dynamite and blasting materials for the mines, away from the actual tunnels so an explosion wouldn’t endanger the miners,” Hopkins shares. It’s also known for its level of paranormal activity. This has given rise to a number of books and documentaries, and has prompted paranormal groups to come in and conduct their own investigations. This catastrophe revolved around two miners working in the Randolph mine who’d entered the Powder House to get some dynamite. While one lit the kerosene lantern at the entrance to the room, the other used his pick to open the wooden crate. He hit it so hard, the dynamite exploded, the pick flew up and became embedded in his chest, and the other miner was thrown against the door where part of the ceiling caved in. That man was the only one to survive. The miner who died is said to haunt the Powder House still. “We had done several investigations through the years there at the Powder House. We’d get weird images in photos and readings on the K-2 (a meter that detects electromagnetic fields and utilizes LED lights for communication),” Hopkins says. “About 12:30am, after the paranormal team left, one of our drivers parked his white truck up on the roadside and walked down (to the Powder House). We kept getting all kinds of energy with meters. It was a dark night, no moon. Then there were no crickets, no sounds at all. Then, all of a sudden, everything started back up again. “At about 2 or 2:30 in the morning, someone outside said to come back out. All was quiet again; air totally still. Then we saw a dark image had blocked the back end of our driver’s truck. We all saw it. One of the guys set a K-2 and a flashlight about halfway to the truck. We asked the image to do things. After some coaxing, the flashlight started coming on, the meter came on. All six or eight of us experienced it. Hopkins shares other sightings, like footsteps in the locked upstairs of the Russell-Rufty Shelter, a hall in the historic park. One February, Hopkins took a team from Carolina Paranormal to the shelter; it was very late. Each July, the Gold Hill Merchants host the Village Ghost Walk. 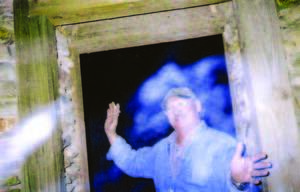 The general public is invited to enjoy ghost stories at the village shops. Visit www.historicgoldhill.com for more details. Whether or not you believe what goes on in Gold Hill to be the dead communicating from beyond the grave, those who have experienced incidents firsthand are staunch in their convictions. For those who are fascinated by the paranormal, this town is for you!